"These individual souffles are easier to make than you might think. To help them rise properly, use upward brush strokes to butter the dishes." I've been long baffled by how easy and quick soufflés are made. They look so impressive; like an airy, pale skyscraper popping up from your ramekin - *giggles*. Besides being easy to make, they're easy to eat because they're so light you can always squeeze room for them after dinner. Light, yet so satisfying. Rating: 3.5 out of 5. - Preheat oven to 375 degrees. Butter six 12-ounce souffle dishes, and then dust with granulated sugar. Whisk together yolks, flour, zest, and 1 tablespoon granulated sugar. - Bring milk to a boil in a small saucepan. Slowly pour milk into yolk mixture, whisking constantly to prevent yolks from cooking. Return mixture to pan, and whisk until thick like a pudding, 1 to 2 minutes. Strain through a sieve, and whisk in butter and lemon juice. - Beat whites until foamy. Gradually add remaining granulated sugar, and beat until stiff peaks form. Stir a third of the whites into the yolk mixture. Gently fold in the remaining whites using a rubber spatula. 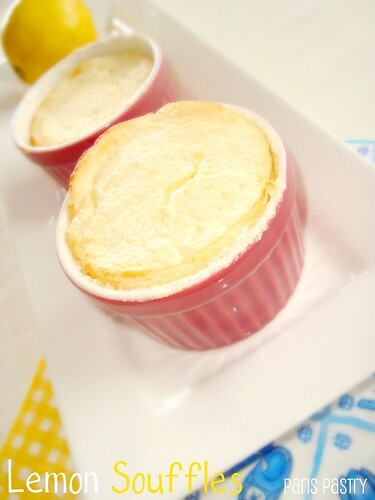 - Fill each souffle dish to the top, and smooth. Run your thumb around edges to remove batter from rims. - Bake on a rimmed baking sheet until souffles rise and are golden, about 16 minutes. Dust with confectioners' sugar, and serve immediately, before souffles lose their height. Thank you SO much for posting this! 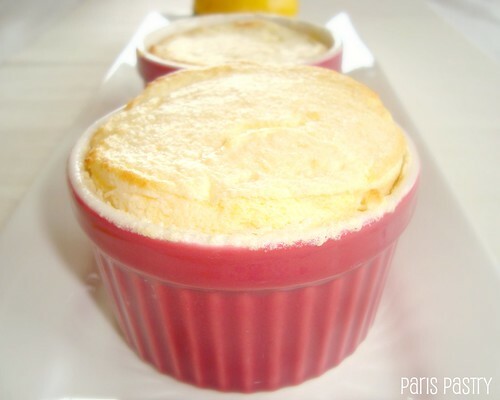 I have been dying to try my hand at Lemon Soufflés and this weekend is going to be it. This look so light, lemoney and delicious!! je laat het zo simpel lijken. ik heb zo veek kook programma's op de BBC gekeken waar er over de moeilijkheid van souffles werd gepraat dat ik er bang van word! haha. These looks so delicious - perfect for summertime dessert. Your post the best recipes, thank you. Hope all is going well for you. Are you still planning to spend some time in Paris this summer. The weather has been gorgeous! These look so pretty and they lok delicious! Gnam gnam! I'm so hungry! Your sweets are always so tempting! These look fantastic, Danielle! I'm still working on my souffle skills. Love how light they look. Great end to a meal, I'm sure. I so keep meaning to make my own souffles, these look marvellous.